Jaan Van de Ven and Ben Gilroy. THE LEADER OF Direct Democracy Ireland (DDI) has stepped down from his position. Following the party’s Annual General Meeting in Drogheda over the weekend, Ben Gilroy confirmed that he had resigned due to personal reasons. 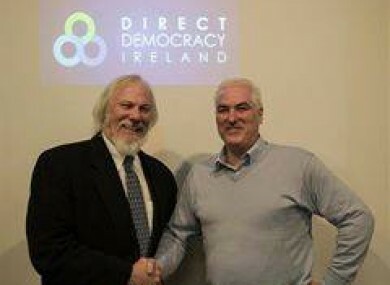 Direct Democracy Ireland said that Gilroy will remain a member of the party and they thanked Gilroy for all his work over the years. Jaan Van de Ven has been chosen as the new party leader, who will lead them into the local and European elections in May. Direct Democracy Ireland said Van de Ven “brings a wealth of experience with him and he received unanimous support from all in attendance at the AGM”. The party, which was set up in November 2012, added that this change over “is the end of an era for DDI but also the start of a new one”. Email “Ben Gilroy resigns as leader of Direct Democracy Ireland”. Feedback on “Ben Gilroy resigns as leader of Direct Democracy Ireland”.